Metti che non hai voglia di stare in città e vuoi andare a fare una piccola passeggiata in montagna, ma, non vuoi nemmeno camminare troppo; quello che potrebbe fare per te è prendere la macchina; a una quarantina di minuti da Trento sopra Borgo Valsugana in Val Sella si trova il bosco incantato di Arte Sella. Ci sono diversi itinerari Noi abbiamo scelto ovviamente il più corto per questo primo approcio primaverile con la montagna. Si arriva con la macchina fino a fine della strada dove si trova un parcheggio libero, da li con una camminata di una decina di minuti si raggiunge Malga Costa. Il mio jack-russel libero in questa passeggiata di correre nei prati che costeggiano il sentiero, tra l’altro con una bellissima vista sulle cime innevate in lontananza. 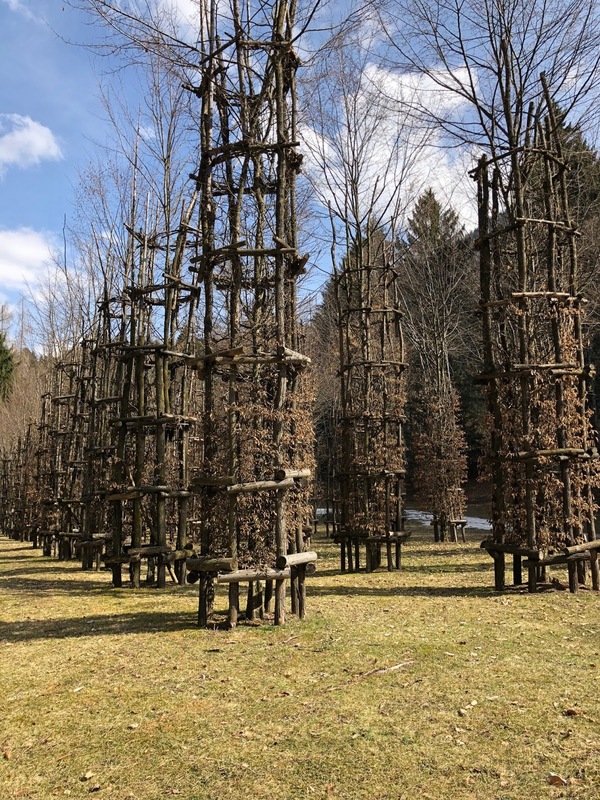 Arrivati alla malga, c’è la biglietteria per la visita al percorso delle opere d’arte nel bosco tra cui la famosa Cattedrale Vegetale. costo del Biglietto Adulto 8.00 Euro. 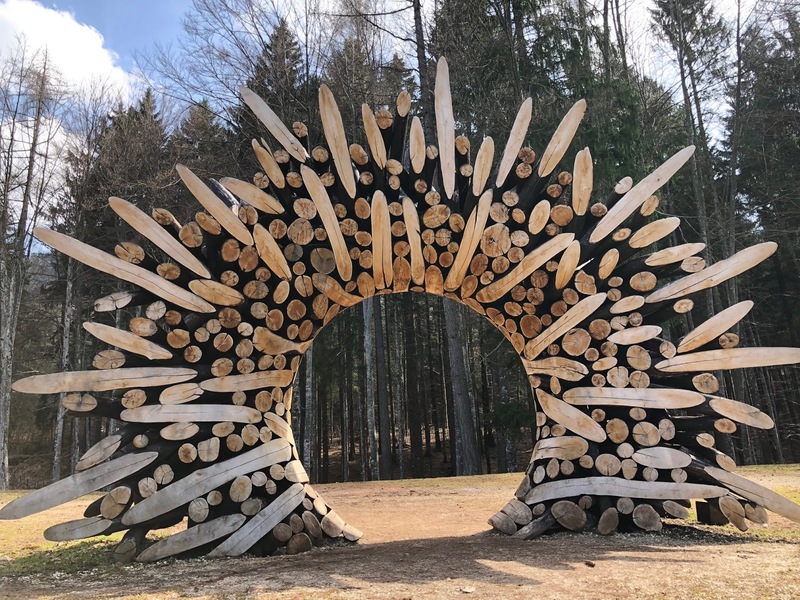 Il percorso ad anello è semplicissimo e non è più lungo di 1 km; diverse le opere e le installazioni di legno nel bosco che rendono il posto in alcuni casi magico, celtico, con alcuni spunti che nell’immaginario riportano alle ambientazioni del Signore degli Anelli. In questo percorso, cani al guinzaglio per il rispetto degli altri e delle opere stesse . Finito il percorso ci si ristora con una buona fetta di torta alla Malga Costa prima di rientrare. Un modo tranquillo e piacevole per passare un pomeriggio di sole primaverile in allegra spensieratezza e immersi nella natura . Ricordo che noi abbiamo scelto il percorso ad anello finale (percorso più breve- ideale per famiglie con bambini piccoli) ma che partendo e lasciando la macchina più in basso si possono fare percorsi espositivi molto più lunghi. Say that you do not want to stay in the city and you want to go for a little walk in the mountains, but you do not even want to walk too much; what you could do is to take the car drive for forty minutes from Trento to Borgo Valsugana and from there reach Val di Sella is the enchanted woods of Arte Sella. There are several itineraries, but we have obviously chosen the shortest one, for this first spring approach with the mountain. You arrive by car to the end of the street where there is a free parking, from there with a walk of about ten minutes you reach Malga Costa. 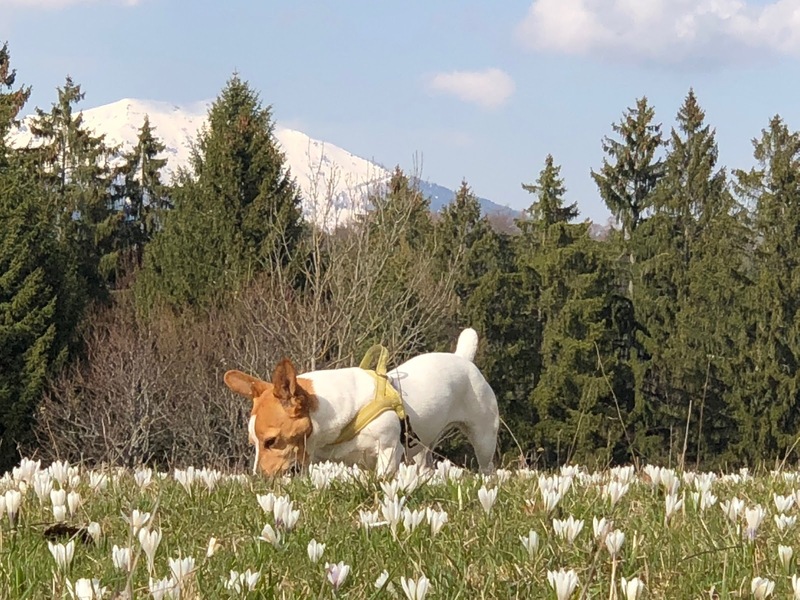 My jack-russel free in this walk of running in the meadows, among other things with a beautiful view of the snowy peaks in the distance. Arrived at the hut, there is the ticket office for the visit of this opena air art museum with installation including the famous Vegetal Cathedral. Ticket : Adult Ticket 8.00 Euro. 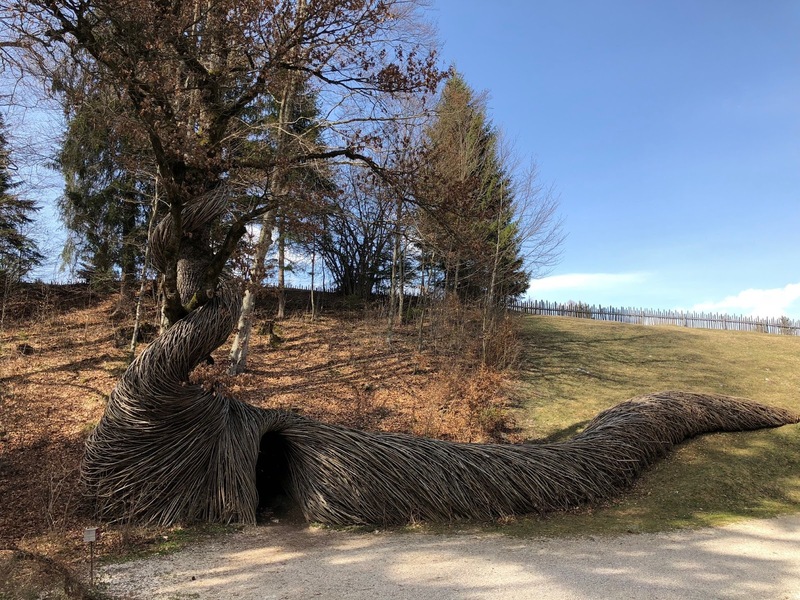 The loop path is very simple and is not longer than 1 km; different works and installations of wood in the woods that make the place in some cases magical, Celtic, with some cues that in the imagination bring back to the settings of the Lord of the Rings. In this path, dogs on a leash for the respect of others and the works themselves. After the tour, refresh yourself with a good slice of Cake in the Malga Costa before returning to your car. A peaceful and pleasant way to spend a sunny spring afternoon in happyness and surrounded by nature. I remember that we have chosen the final ring route (shorter route – ideal for families with small children) but that starting and leaving the car further down you can make much longer exhibition routes. Curiosity: for the fans of the singer Elisa the wood cathedral is the one that appears in the video Fresh air or Forgivness or anyway those related to the album Ivy (2009) https://www.youtube.com/watch?v=RhlOJotX_Jo , (Among other things if you know the songs and videos of which I speak the sensation of visiting the Arte Sella path, is that of the purity and refinement of the songs themselves, with the music on our mind you can perceive the music with the sight and the smell. L’ha ribloggato su TREat – Travel – Read – Eat.